At our Bexley boutique we have a wide range of designer wedding dresses. The British designers we stock create gloriously classic short wedding dresses with a modern twist. Loulou bridal is a fantastic British designed award winning label offering elegant vintage style dresses. We’ve picked three classic short wedding dresses from the Loulou collection. The mix of textures and colours make their dresses truly unique and loved by brides to be. All three have lace used in different ways to show that it has a modern edge to it whilst still being vintage inspired. With over 150 retro wedding dresses, we know you’ll be spoilt for choice when you visit us. You can also use elements of the dresses we show you to create a stunning bespoke tea length wedding gown. Trudy is a pretty vintage inspired wedding dress with a soft and flowing skirt. Tiny polka dots cover the whole dress. Lace covers the bodice and cascades over the tea length-wedding gown. The sleeves are full lace and sit on the elbow beautifully. There is a button up detail on the lace back that creates the wow factor for this gown. The movement of the skirt and details combined are breathtaking up close so be sure to check this wedding dress out when you visit. Posy is a beautiful vintage inspired 1950s tea length wedding gown. The bodice is covered with lace to soften the structured look whilst also offering support. Trimmed with a wide satin double bow belt, adds extra glamour and brings the eye to the skirt. The skirt hem also has a lace scalloped edge. Its available in a range of colours from Ivory or white all over to Ivory over pink or blue. It’s even an option to have a stunning ivory over gold for a real sumptuous feel. This is ivory over ivory. 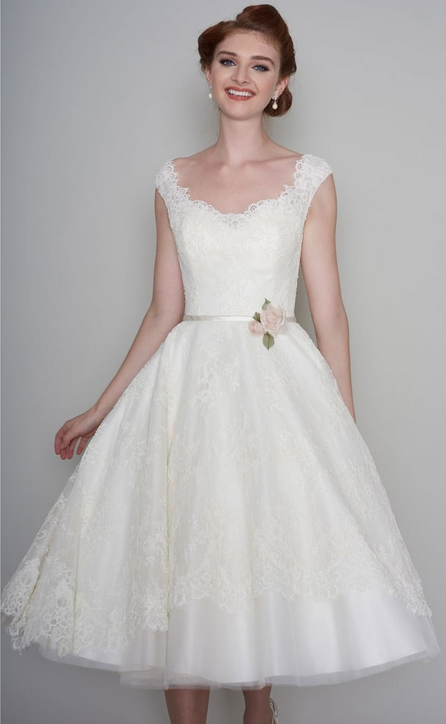 Daisy-Rae has a gorgeous off the shoulder detail in lace and a tulle full skirt. 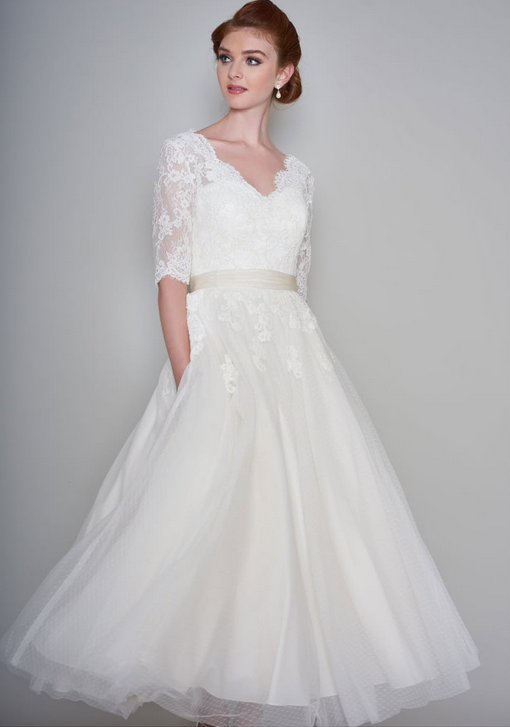 One of the stunning classic short wedding dresses with a twist, the lace falls short at the front to show off the tulle. At the back of the dress the lace fits to the hem and has an scalloped edge. Finished with a slim satin belt with a flower detail, it really finishes off the vintage style look. These bridal gowns are available in a range of beautiful colours including ‘ash rose, blue’ baby pink, mocha, vanilla, grey and more by special request. Book an appointment to try one of these short wedding gowns today. Your appointment will be one to one. Enjoy the relaxed environment whilst trying as many classic short wedding dresses as you like.